Found 7 file extension associations related to KDevelop and 4 file formats developed specifically for use with KDevelop. several plugin tools, extensible modules which can be loaded at runtime and on demand. This allows you to only turn on those features you really need. a set of other diagnosis, documentation, and optimization helper tools. The KDevelop IDE — this is the place where you will usually work. The stand-alone KDevelop Assistant documentation browser — isolates all the powerful documentation facilities of the KDevelop IDE in a separate tool. This comes in handy when you want to look up some programming documentation but do not want to start the full IDE. 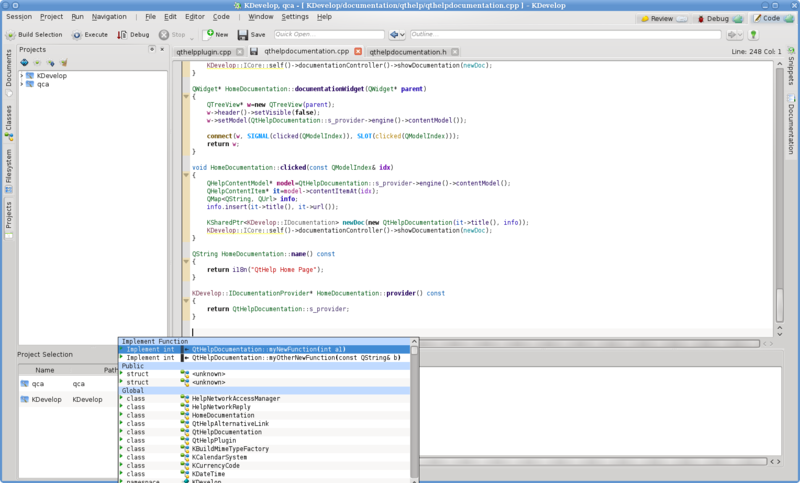 The KDevelop Designer — enhances the Qt™ User Interface Designer by KDE specific elements and integrates nicely in the KDevelop IDE. If you need more information please contact the developers of KDevelop (The KDevelop Team), or check out their product website.